In my last blog, we looked at a passive way to gather information necessary for a hack. The advantage of using passive recon is that it's totally undetectable, meaning that the target never knows you're scouting them and you leave no tracks. The disadvantage, of course, is that it's limited to only some websites and not entirely reliable. 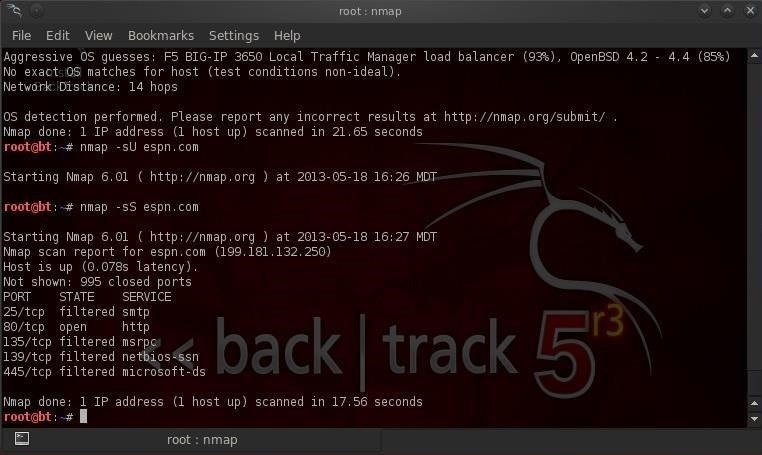 In this tutorial, we'll look at active reconnaissance of a target with one of the best network scanning tools, nmap. The risk with active scanning is that you will be detected and the security hardware or security admin will block any further attempts by you to pwn the site, or worse—report you to law enforcement. 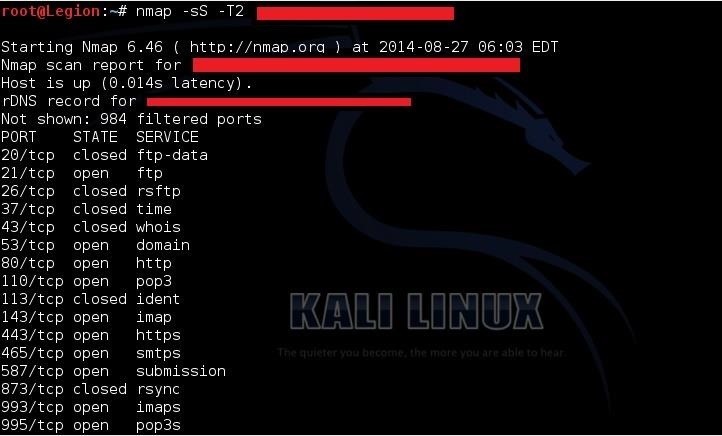 Nmap has multiple modes of scanning a potential target and many ways of evading detection. 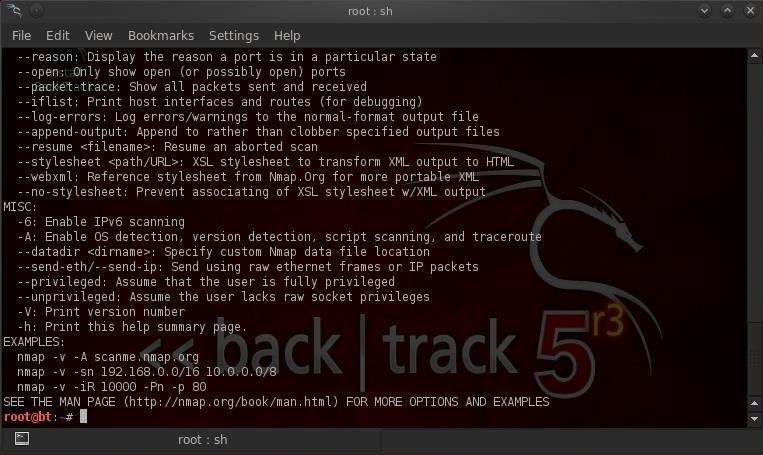 Let's go to our hacking platform, BackTrack, and open up nmap. To find it, go the BackTrack button at the bottom left of the screen to open up the initial menu options. 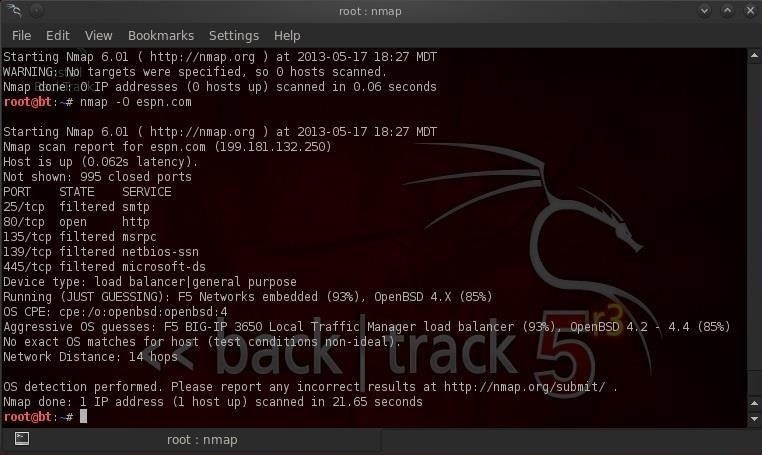 Then, select BackTrack -> Information Gathering -> Network Analysis -> Network Scanners, and click on nmap. 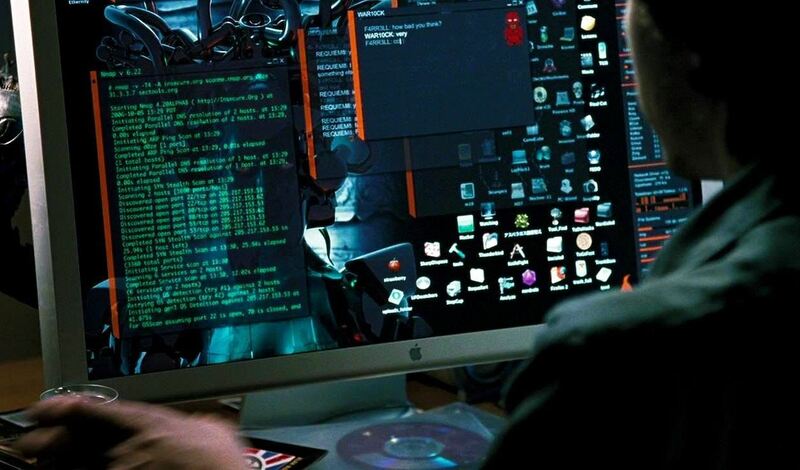 When you select nmap, you'll open a screen that looks like the screenshot below. We can see some of the output below. 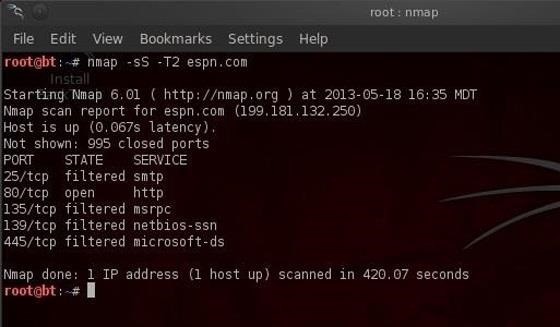 This command tells nmap to scan (-s) using TCP (T) the domain espn.com. Note that the output shows us the ports that this web server has open. With this information, we can then reasonably conclude that the default services for these ports are running on this system. In this case, this server has port 25 open (SMTP), port 80 open (HTTP), port 135 open (msrpc), port 139 open (net-bios), and port 445 (msds). This is important information to have when selecting a hack/exploit as each hack is specific to technologies/services. We can see from the screenshot above that nmap guessed that this site is running F5 Networks with a 93% probability and OpenBSD with a lower 85% probability. The above scan by nmap is highly reliable, but its drawback is that it's also easily detectable. Nearly every system admin will know that you're scanning their network as it creates a full TCP connection, and this is logged with your IP address in the log files. As we can see in the screenshot above, it gave us the same results without our activity being logged by the target system. Most commercial servers and websites have intrusion detection systems (IDS) protecting them. These systems look for telltale signs of malicious activity, then alert the security administrator. Scans such as ours are easily detected by these systems and can set off an alert. However, there are numerous ways to evade these IDSs, and we'll look at one here. The -T2 setting tells nmap to use the sneaky speed. This scan will likely take longer, but it is much more likely to go undetected by the IDS. 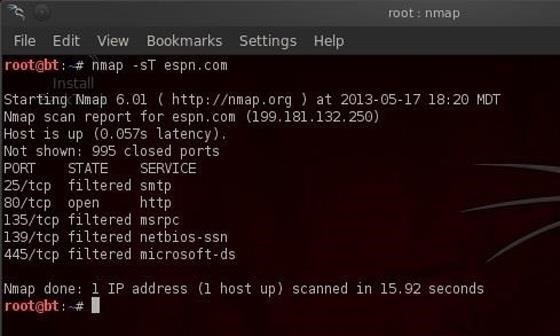 Nmap can also be an excellent denial of service (DOS) tool. If several individuals all send packets from nmap at a target simultaneously at high speed (nmap "insane" speed or -T5), they're likely to overwhelm the target and it will be unable to process new website requests effectively, rendering it useless. We'll continue with more reconnaissance techniques in future tutorials, so keep coming back! Until then, feel free to ask questions on this topic below, or head the Null Byte forum for any questions off topic. News: Banks Around the World Hit with Repeated DDoS Attacks! I can't update Metasploit Framework in Backtract 5R3. I'm running it with Virtualbox, and when I type "msfupdate" in the msfconsole, it says "Authentication realm: <https://www.metasploit.com:443> = MSF must be updated via GitHub or a more recent msfupdate. See [http://r-7.co/MSF-SVN for more = . How do I go about fixing this? Is it because Tortoise SVN is installed on my computer? You must logged in as root to update Metasploit. Try again as root. How do I log in as root? It says "Password for root:" and then it gives me the same error. It then asks for username. Not entirely sure where to go about acquiring that. Sorry for the noob questions. On a different note, is there any chance you'll be giving us tutorials on how to use Kali or BTR3 to get into more modern systems like Windows 7? (To install meterpreter.) I've been having trouble getting it on a computer, because I have no physical access to the machine I want to get into, and the methods you outlined in your previous tutorials use old methods (MW2010, IE8, Adobe Reader 9). The password for root in BackTrack is toor. I will be offering some tutorials in the near future on exploiting Win 7, so stay tuned. By the way, Microsoft Windows 2010 is still very current and about half of all computers still have Adobe Reader 9 or older, so those techniques will work on most computers. Not sure if that's on my end, or what. If it at all matters, I'm using the GNOME BT5R3 .iso. I don't know how is it in BTR but in Kali if you didn't use the network mirror in the installer, you can't download things from the repositories. Go to /etc/sources.list and put in the Backtrack repositories. When log in to BackTrack when it first boots up, do you log in as "root"? I'm not sure where you are logging in at. I'll list step by step what I do. 4) It opens the terminal / console / whatever with the root@bt:~# prompt. I type "startx" to get it to startup. 5) The default desktop of BT5R3. It sounds like you haven't installed BT5r3 but are running the live CD in Virtual Box. You should install BackTrack in Virtual Box or am I misunderstanding you? I read somewhere that you're able to spoof your IP and Mac addy into something else, and in addition, if one were behind a proxy, too along with the spoofing, would he then be safe from detection? You can spoof both your IP and MAC address. Its a good first step, but doesn't necessarily mean your are safe. When you spoof your IP, you can't get a connection to the target. All replies go to the spoofed IP. Works great for DoS attacks, but little else. As for using proxies, that's a good idea, but it will still leave behind telltale signs that they were compromised. You will make it harder to track you, but ideally you don't even want them to know you were there. are we must use linux to do a DOS attack ? You do not have to use Linux to do a DoS attack. There are many tools in Windows to do a DoS. Do SYN and TCP risk detection? Or is one of them undetectable? Also there are FIN and ACK, can they be used instead? All of these are detectable, but generally, scans are ignored by most security admins as they are so numerous. A TCP scan, though, will be logged, providing evidence of your IP address when someone detects an intrusion. FIN and ACK can be used, but generally, do not work on modern Windows systems. Please make more recon tutorials, they're awesome. I assume this server is on your network as it has an internal IP address? "If several individuals all send packets from nmap at a target simultaneously at high speed (nmap "insane" speed or -T5), they're likely to overwhelm the target and it will be unable to process new website requests effectively, rendering it useless." It is unlikely that single individual can DoS a server, but "numerous" individuals running this command likely will, at least for awhile. When i DoS a network, i just send a ton of death. requests which doesn't allow anyone to connect. Well, that is the idea of DoS attacks. Your DNS is not workng. how can I fix it ? and I have a question so far, all tutorials you made, we need to use a usb wireless adapter for all of them (tutorials) ? Are you running in a VM? If so, usually you can simply re-boot your system. It could be many things, but check your /etc/resolv.conf. It should have a public IP of the DNS server. You can use an internal wireless adapter with BackTrack if it is not in a VM. Because most internal wireless adapter don't have the capability to hack, you are best getting a aircrack-ng compatible external wireless adapter. Yes I'm running in a VM but you didn't answer to my question exactly. I will be most clear. My question is, for all tutorials on backtrack (or Kali) we need to use a external wireless adapter ? Then will then need an external wireless adapter. I'm using a netgear WNA3100 and on aircrak-ng website I can see only netgear WNDA3100. There are a problem ? the "D" makes problem ? If its not on the aircrack-ng list, its not compatible. How exactly should I interpret this ? The services are not running on its system ? And what more is usefull? I'm not sure what you are asking me. I don't exactly know how to go about this information (what to do with it) but I realise it would imply a lot of explanation and I don't want to waste your time. I shall try and find infos by myself. Thank you anyway! can u do the 'sneaky' setting in conjuction with the tcp connection whilst using an anonymizing network such as I2P? I am new in null-byte and i shocked to see that null-byte is the sea of knowledge for beginners. Thanks again for this kind job. now I'm learning about reconnaissance using nmap, nikto... but I need to know what I do with this dumped information? You wrote -sS option is stealthy (at least stealthier than -sT option). But I do not see any difference in packet capture in the scanner machine. Would you please explain?